Choice of Amethyst, Citrine or Garnet. Filigree links and Cubic Zirconia accents. 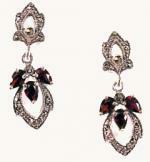 Filigree links with choice of Cubic Zirconia or Diamond accent. Choice of frosted Quartz Crystal or Black Onyx. Frosted starburst Quartz Crystal with Sapphire and Cubic accents. Choice of Amethyst, Sapphire, multi gemstone or Black Onyx. Choice of Diamond, Sapphire or alternating Diamond & Sapphire accents. 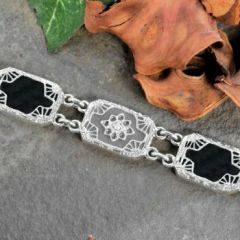 Featuring alternating frosted crystal & black onyx links with diamond accents and a filigree clasp. Choice of frosted crystal, lapis & crystal, onyx & starburst crystal or onyx. Featuring a 10x8mm bezel set gemstone in your choice of emerald cut amethyst, blue topaz or black onyx. Choice of Amethyst, Garnet or Black Onyx.